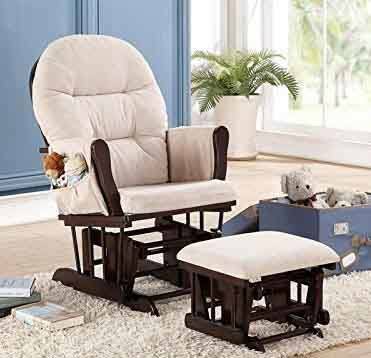 A great nursery glider or rocking chair will help you rock your baby peacefully to sleep, and become a comfortable and secure place for breast-feeding, best baby book reading, and establishing a good bedtime routine. Our hands-on testing considered 15 different gliders and rocking chairs, and focused on comfort, versatility, features, reliability, safety and and the finger-pinch factor, durability, and price. Here are our top 5 results, followed by in-depth reviews. Here are the Best Nursery Gliders of 2019! 1. Stork Craft Hoop Nursery Glider. About $150. The Stork Craft glider has been around for years now, and hasn't changed much in that time. Though there are some relatively unique patterns available (like the cute chevron pattern), the overall glider keeps the look and feel of their gliders from 5-7 years ago. That's not necessarily a bad thing, and you get good bang for the buck, especially with the less expensive simple beige color option. For about $150 you get a solid glider and ottoman that should last you for the couple of years you'll reasonably need to use it, placing it the top of our list for bang-for-the-buck and overall comfort and reliability. We found the features very similar to the Naomi Home option: smooth gliding motion, side arm pockets, included ottoman, and reasonably comfortable cushions. The bottom cushion was a bit on the thinner side, like the Naomi Home. We did find the Naomi Home option to be of higher build quality, at least judging by the units we tested. The Stork Craft had some paint drip marks on the white wooden back, and a little wood chip on the bottom (right out of the box). 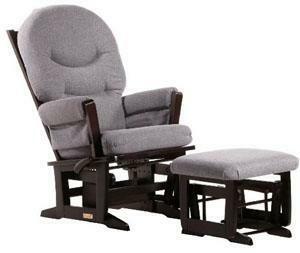 But this is one of the least expensive nursery glider and ottoman combination on the list, and we think that you really can't go wrong for the price point, even if it doesn't have the build quality of fine home furnishings. It also doesn't have a ton of features like the Dutailier model, like there's no lock-out for the gliding motion, or adjustable recline. We did find the glider and ottoman to be smooth and supportive, and overall thought it was quite easy to assemble, and felt pretty sturdy and reliable. It's a good piece of nursery furniture that looks nice and performs quite well. If you're looking to save a bit of money and probably still be able to sell this for $50 on Craigslist after a few years, then this is probably the best bet. Interested? You can check out the Stork Craft Hoop glider here. 2. Naomi Home Brisbane Nursery Glider. About $150. This is a super comfortable glider, with a nice smooth gliding motion, comfortable cushions, and a good build quality for the price (reminds us of the old Shermag and Dutailier gliders, which were also very high build quality). It's up here on our list because it really offers some excellent bang for the buck. There are some great features here: the gliding motion is smooth, though not quite as long as some of the others. But at $170, you're not going to get many of the features that make some other models stand out. There is no lock mechanism on the glider, so there is a higher risk of pinched fingers, and sometimes can be awkward to stand up from while carrying a baby. The gliding motion is smooth but not quite as long as some others, the back is not reclining, and the bottom cushion isn't quite as thick and comfy as others. All that being said, if you're looking for a less expensive glider with good build quality and medium-to-high comfort, this is a great option. Like the others, it took us about 20 minutes to put this together. Some things were really nice: it has a slightly wider hip area which is nice and big enough for baby legs to comfortably lay to the side, and convenient side pockets for books, wipes, or whatever else you'd like to keep at arm's reach. The high-back was nice, not quite as high as the Dutailier, but high enough for the less vertically inclined parents to comfortably rest their heads. The arm cushioning was a bit lacking versus the Dutailier, but again it's about a third of the price. Overall, very high bang for the buck, though we wish they had included a locking mechanism. Interested? You can check out the Naomi Home glider here. 3. Dutailier Ultramotion Nursery Glider. About $575. OK, we do realize this is a very expensive glider and ottoman combination, but it's really a great glider and ottoman combination, save for some issues with quality and reliability. It was our best nursery glider of the year for 3 years in a row, but more recently has suffered a few quality control issues. But there are some excellent features of this glider that make it stand out against basically all of its competition. Unlike many other gliders, the Ultramotion is made by a reputable furniture company that produces generally high quality products. The proof is in the fabric, cushions, long and smooth gliding motion, reclining back, retractable footrest (!) in the ottoman, and high build quality. This is the ultimate glider and we fell in love with it in about 5 minutes. The cushions are super soft and supportive, the fabric is durable and easy to clean, the locking mechanism has multiple positions, and it is just overall a perfect glider. We didn't find any negatives about this except for the price and build quality. At over twice as much as most other gliders and ottomans, it will cost you! If you value comfort, features, and durability, and don't turn green at the thought of spending $575 on a glider, then this is the one for you! But for this cost, we expected higher build quality and reliability, and better overall customer service. Note that they also make a beautiful, and white sleigh style version. Or you can check out their very comfy Grand Glider model. Interested? You can check out the Dutailier Ultramotion glider here. 4. 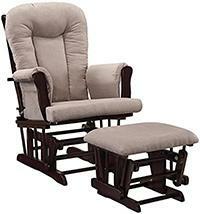 Baby Relax Nursery Glider Rocker. Usually about $175-200. The Baby Relax company is relatively new to the baby glider and rocker market, and they have a wide range of styles and products. They tend to run a bit less expensive than most other gliders and rockers, particularly for the gliders more in the style of a living room chair (like the Thomasville below). The lower cost tends to translate to lower overall features, but the quality of these chairs is actually quite reasonable given the price point. We tested out the Baby Relax Glider (pictured), and thought it was quite similar to the Naomi and Stork Craft options in terms of features and comfort. We did think the build quality wasn't quite at that level, however. The chair uses a microfiber cloth with padded arm rests, seat, and back, though the padding isn't very thick or comfortable on the arms or lower seat. The padding near the shoulders and head, however, was quite nice and thick, which we appreciated. We also found that the seat is quite narrow, which might pose a comfort issue for larger moms or dads. It includes an ottoman, and there are some pockets on the side of the arm rests. Like the other inexpensive options, there is no locking mechanism, no recline. The assembly was a little involved, taking us about 30 minutes, and the overall quality of the parts didn't seem on par with some of our other inexpensive options. Overall, this newcomer is providing reasonable quality gliders for a very reasonable cost. Time will tell whether they will climb the list, after proving themselves in the reliability department. Interested? You can check out the Baby Relax glider here. 5. Shermag Nursery Glider Combo. About $250-350. Back in 2011 the Shermag was at the top of our list for best glider and ottomans. It was well-made, and honestly the most comfortable glider on the market. The cushions beat out the Stork Craft version by a long shot, it included the locking mechanism, and in our testing it was well constructed and outlasted many of the others. Now fast-forward 5 years, there is more competition on the glider market, and Shermag slipped a little behind in the ratings. Granted, it still makes our top gliders list, so it's still one of the best on the market. But the build quality, like the Stork Craft, is inconsistent. So the Shermag and Stork Craft are pretty similar to one another with a few primary differences. First, the Shermag has more comfortable seating cushions, especially the thicker bottom cushion. Second, the Shermag includes the locking mechanism, which we think is very important in a glider. Third, the Shermag does a good job padding the arm rests, and providing a thick head rest area, and we believe it has a nice sleigh style that comes with more expensive units. Outside of that, you're basically getting a similar glider to the Stork Craft, but paying a premium for the thicker seat cushion and locking mechanism. It was a toss-up whether to place the Shermag at 3rd or 4th place, and in our opinion it is a close tie since it's difficult to attach a price to a comfier cushion and locking mechanism. If you can pay the increased price of the Dutailier, go with that option; if you have a limit around $250, go with this option. But if you can't stomach this type of cost, then go with the Naomi. Interested? You can check out the Shermag glider here. 6. Windsor Nursery Glider and Ottoman. Usually about $125. The Windsor glider and ottoman are the lowest priced glider and ottoman combination on our list, and it has some decent things going for it. First, it was reasonably comfortable, particularly the upper back padding, though the bottom seat padding was a bit thinner than other options, and lumbar support was severely lacking. Second, the gliding motion on the chair was smooth, as was the ottoman. Third, we though it was a really adorable nursery glider, with some cute colors and patterns. 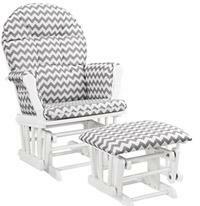 The one we tested had the chevron pattern, which looked really cute in our baby's room! 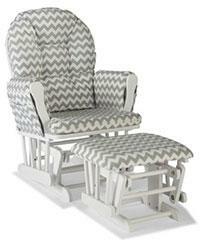 This nursery glider and ottoman combination is all about the price point. If you're looking to spend the absolute lowest price possible, then this one is for you. But that lower price also leads to fewer features and overall lower build quality. It does not have the glider lock-out, or recline. The craftsmanship is rather poor and the wood pieces are not very strong. Though we only tested it for a couple weeks and things went well (save for a little squeak from the cushion while rocking), several reviewers online have demonstrated that the reliability of this unit is below average. Moms report several issues, including wooden dowels breaking, and gliding mechanisms breaking or sagging. So while it looks pretty darn cute, and the basic functionality is there, this chair isn't likely to last very long with daily use. Interested? You can check out the Windsor glider here. 7. Thomasville Kids Grand Royale Glider. About $500. Though we are partial to the gliders, we think that there is something to be said for having nursery furniture that doesn't look like it only belongs in the nursery. 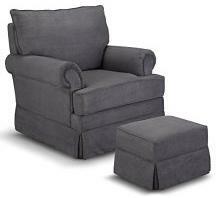 The alternative is to get a more comfortable living room chair that integrates a gliding and swiveling motions. Though we think they lose out to gliders because the low-back doesn't support a sleep parent's head, they definitely win in the furniture versatility and style departments. This best-selling microfiber chair is one of the most comfortable glide/swivel low-back chairs we've sat in. Not sure how supportive it actually is for breast feeding, but we'll let you be the judge of that one. 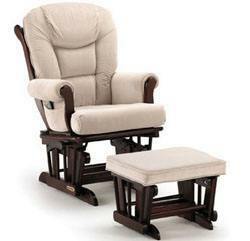 What we do know is that this is a good nursery glider for plus-sized moms as well, given its wide seating surface. Overall, this chair has fantastic furniture-grade build quality, and the fabric is soft and easily cleaned. In our testing, we didn't really like the swiveling motion, which made me a little motion sick and made it difficult to stand up from. They go a little overboard with the motion on these. Interested? You can check out the Thomasville glider here. Glider versus Rocking Chair. As a bit of a traditionalist I was convinced that I wanted an old school nursery rocking chair, something wooden and vintage, creaking a bit and bringing back old memories with every push. There's definitely something to be said for rocking chairs, but there's also something to be said for soft carpeted floors, and as it turns out rocking chairs and thick carpeting don't mesh so well. Rocking chairs also aren't great for parents putting their feet up on an ottoman. While a glider will let you glide back and forth with your feet up on the ottoman by rocking your feet forward/back, the rocking chair responds awkwardly to any attempts at gentle rocking with the feet up. Also, with a traditional rocker you need to strategically place cushions or the chair will get uncomfortable after a few minutes. But there is the style and space benefit: a good wooden rocker is not only great looking but takes up less space than a modern glider. And a foot rest can help bring your knees up a bit and keep things more comfortable. Though we do think that the style of the traditional rocker is a plus, we do think the features and comfort (for baby and parents) of a nursery glider definitely put it at a strong advantage. So our list this year only includes gliders. High-back versus Low-back. Some modern gliders look more like living room furniture, like the Thomasville Grand Royale Glider. While these can make more comfortable options and fit in nicely with a nursery decor, they have the low-back disadvantage. You won't realize this until you're using it one sleepy evening and you want to put your head back to rest with your little munchkin. The high-back ottomans with the wooden frame and cushions make a better option here. So think about the trade-off between having a nice furniture-like style versus being able to relax a bit yourself by putting your head back. If the moment comes when you want to take a little nap with your baby, you might regret purchasing a low-back glider. Also, through our testing we came to the realization that the low-back furniture style gliders tend to over-do it a bit on the gliding and swiveling, making it a bit of a wild ride until you get used to how it moves. On the other hand, it is nice that you could use this as a (somewhat) regular piece of furniture once your baby has grown up! To Ottoman or not to Ottoman? Some of the best nursery gliders include the ottoman in the package whereas some others make you pay a little extra (well, sometimes a lot extra) for the ottoman. In our opinion, the ottoman is always worth the cost. Even if you don't imagine yourself using it at first, your future self will be grateful if you splurge for it now. It definitely adds to the comfort factor for parents, and it also doubles as a convenient little place to put a book or bottle during quiet time with baby. Of course, it does take up more space in the nursery so be sure to take some measurements beforehand! Locking and Finger Pinching. While wood frame nursery gliders are fantastic and provide a super smooth and comforting gliding rhythm, they also have several pinch points toward the bottom where little fingers or pet paws can get into trouble. We highly recommend getting a nursery glider that has a lock lever so you can lock out the gliding motion when not in use. Babies love standing and pushing the glider back and forth, but the risk of pinching and injury is not worth it! Comfort and Durability. We saved what is probably the most important for last: comfort and durability! The best nursery chairs that made it to the top of our list in terms of comfort. There were many brands that just didn't make the cut because their padding was too firm, the back was to straight up, the gliding was clunky, or the arm rests were awkward. There were also a few nursery gliders that literally started falling apart within the first week of use, usually screws falling out or cushion ties ripping off. But that's another story, and we do not include those in our list!